I was, it must be said, well within spitting distance. The front row of Cristina Hoyos’ School of Flamenco nightly show put me up close and very personal with two of the most intense flamenco dancers I have ever seen. It left me quite breathless. For the first time I was able to finally understand the sheer majesty and moves of Flamenco performed at the highest level. The dancing and guitar playing was stunningly impressive, and made all the more so, after touring Hoyos’ museum, which remarkably charts the colourful history of this flamboyant dance. 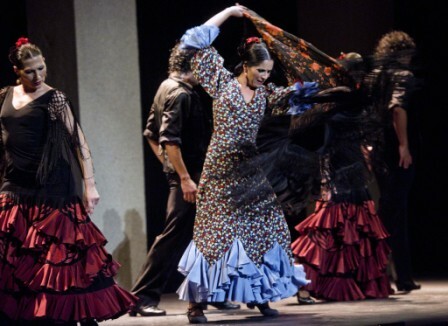 Seville is the home of Flamenco, its roots firmly entrenched in the Moorish culture so evident all over the city. 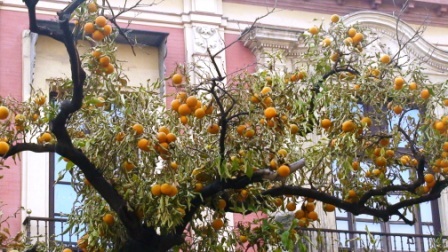 From the incredible Alcazar Palace, where Columbus himself plotted his route to the New World and walked these very halls, to the fabled Seville oranges whose trees and scent seem to decorate the city wherever you go. That said of course, you wouldn’t want to eat any of them (although it’s perfectly acceptable to pick them off the trees) as they’re destined to be for marmalade. The bitter taste would put off even the most hardened of orange admirer. 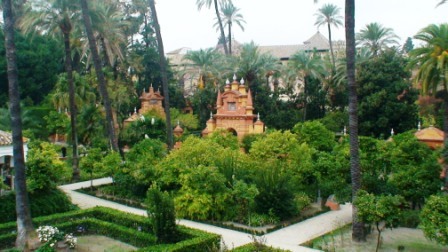 Seville is a city and region steeped in history. It is after all, over 2,000 years old and the cultural, financial and artistic capital of southern Spain. It was no less, the exclusive entry port for goods from the New World and enjoyed an enviable reputation as the home of royalty. The horse drawn carriages still rattle around cobbled streets as they did many years ago, although nowadays the price is a little steeper and the only passengers are tourists. Much of this former glory is still very much in evidence throughout the city, the Alcazar Palace together with its sensational gardens and the gloriously gothic 15th century cathedral the undisputed highlights. But there is much more to enjoy in this delightful place. It is a city designed for walking. Just wander around the old town, mix with the locals and lap up the atmosphere. There is the Guadalquiver River, its fast flowing waters splitting the city in two and providing the perfect canvas for bridge architects over the years. Standing there in the middle of Triana’s Bridge one of Seville’s most famous, you have to ponder and reflect looking at the almost timeless scene before you. It’s also a city that unashamedly celebrates food, after all, it is said that tapas was created here too, after Seville’s citizens took to covering their wine glasses with pieces of bread to keep flies off the wine. They say the city stops for lunch and that could well be true, because it is a very serious business that will stretch for hours on end. Taberna del Alabardero is worth a visit simply because it began life many years ago as the brainchild of a priest who took in young vagabonds and taught them the art of service and waiting rather than crime. It ultimately failed, as no one trusted the waiters to keep their hands out of the patron’s pockets, but today it is still a training school although the vagabonds have long gone. Boutique hotel Casa Romana is an excellent place to rest your head. A former 18th century inn, this is a stylish retreat right in the heart of the historic quarter. Its open courtyard and Romanesque columns convey a feeling of laid back luxury with well appointed rooms backing that up. Make sure though that you get a room in the old wing. 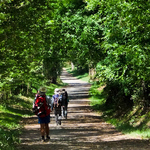 Seville also offers you a chance to savour the Andalucían flavour of its countryside outside the city, with its rolling hills and olive groves. Perfect horse country, and talking of horses you should visit Cortijo El Esparragal, a former monastery and now one of the largest and oldest farmhouses in Andalucía and a pretty impressive hotel to boot. 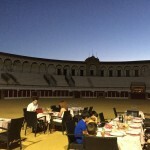 Its thousands of acres are used today to breed Spanish horses and bulls, and there are regular events held there to show of these magnificent animals. The restaurant is very well known haunt of the locals for its authentic regional cuisine. So authenticity brings us neatly back to Flamenco and my front row seat. The dancing – outstanding, the magical hands of the accompanying guitarist simply sensational. Just be on guard for any overzealous salivating singers whose enthusiastic efforts may well bathe you unexpectedly.